Are you interested in being a voice of health for your community? 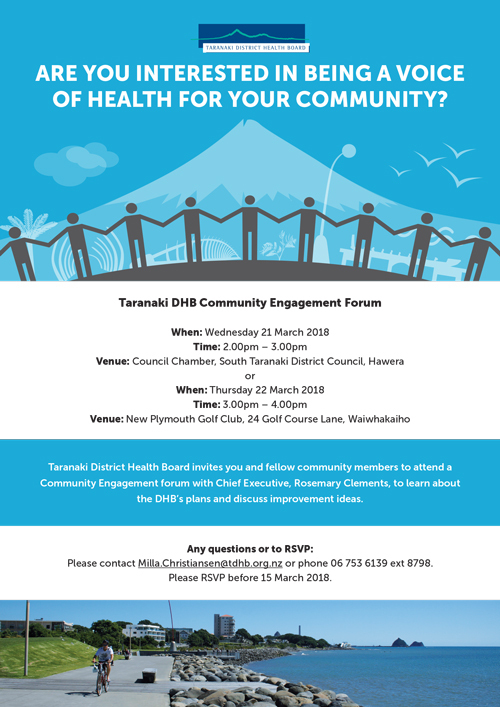 Taranaki District Health Board invites you and fellow community members to attend a Community Engagement forum with Chief Executive, Rosemary Clements, to learn about the DHB's plans and discuss improvement ideas. Please contact Milla.Christiansen@tdhb.org.nz or phone 06 753 6139 ext 8798. Please RSVP before 15 March 2018.